Bob Olwine saw them walk down the steps and descend into four feet of water. "They probably just figured it was a small pond and they could swim across," says Brian Eyler, a deer biologist with the Maryland Department of Natural Resources. 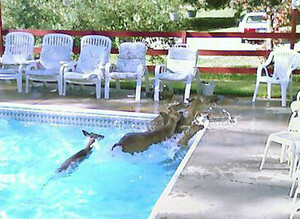 "I've heard of deer getting stuck in pools before, but don't know anyone who actually saw them walk in." He was pretty amazed by the whole thing. And even more amazed when, in the next instant, three smaller deer showed up and pawed and clawed their way under the fence in an attempt to get into the pool area. They apparently wanted to go swimming, too.